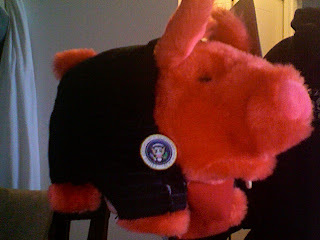 In honor of our 44th president, Barack Obama, I present to you my non-winning pig in a costume dressed as Obama himself. Politics aside, today America made history and I'm grateful it happened in my lifetime. I agree....all politics aside, a great day for everyone. My husband cheered loudly when President Obama thanked the waitstaff during his luncheon. Love the pig, by the way. Big time history. Proud 2 B American again.